Time just seems to constantly escape. I am always putting this blog on hold because I have something else I need to do. I’m always thinking that I will get back to it later. The next thing I know it’s almost a month since I posted on here. It has been a busy month. I’ve been working out a lot and getting into shape, I’ve been preparing my seedlings, getting ready for C2E2 and of course writing. All of this while trying to do all the normal family things like play shuttle for my son to karate and baseball, play counselor to my husband, and financial adviser to my stepson. It’s a busy life. I went to a lecture by Max Brooks, author of Zombie Survival Guide and World War Z. That was fun. I love how he admits that his book is based on an actual survival guide. It amazes me how many people did not realize that. It’s a basic survival guide with a small twist. Zombies just makes it more interesting. 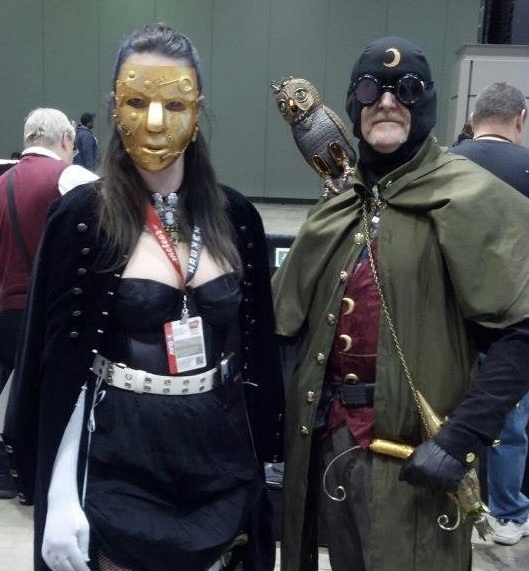 I went to C2E2 on Friday we were steam punk Madame Masque and Doctor Midnight, then Saturday I just grabbed my ren faire armor because it was easy and got to meet the one and only Julie Newmar. The poor woman was exhausted so I kept it brief and told her that I was a big fan of her rose garden and would love to see some more posted about that and after looking at her Facebook page it appears that she has.